Choose from our range Valentines Balloons in many colour options & sizes. In Latex and Foil both can be helium filled. We have Balloons and Party Supplies to co-ordinate with Valentines day and so much more. Just add ribbon & balloon weights for desired effect if your buying the balloon deflated. If inflated then you will be supplied with ribbon & weight as standard. 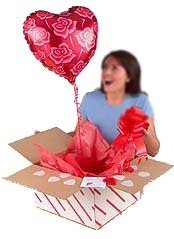 You can have your 18 inch foil balloons delivered in a special box by courier to your loved one. Just select this on the​ drop down menu on each balloon. Balloon: Pack of air-filled letters "I Love You"